Case presentation: A 28-year-old male patient from the rural part of Bale zone, Ethiopia, was admitted to Goba Referral Hospital with high-grade fever, diffused abdominal pain and abdominal distension. Initially, he experienced colicky and intermittent pain that made him stay at home for 2-3 days. He then started to develop constant left flank pain which gradually got worse and was associated with urinary frequency of approximately 5–6 times/day, high-grade intermittent fever, chills, rigors and loss of appetite. With the diagnosis of generalized peritonitis, we resuscitated him with two bags of normal saline and one bag of ringer lactate intravenously. During an abdominal ultrasound examination we identified that the left kidney was replaced by an abscess containing sac, and there was a huge intraperitoneal loculated abscess with internal septation and an associated free inter-loop and pelvic echo debris abscess. When we performed an exploratory laparotomy, 1 L-thick abscess from the general peritoneum was aspirated and early fibrinous inter-loop adhesion was identified. 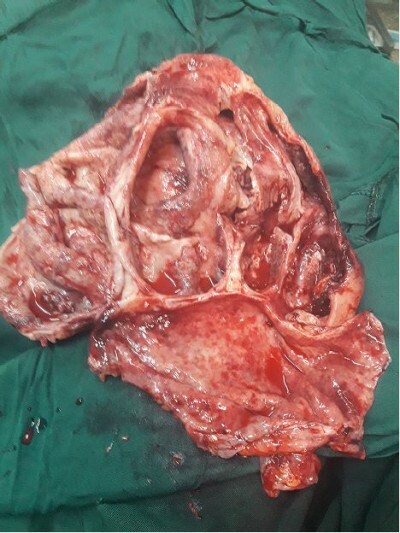 In addition, there was a large retroperitoneal cystic abscess containing sac extended from the spleen up to the pelvic brim crossing the midline to the right side and bulged intraperitoneally. Furthermore, a 1.5 cm wide perforation that pour abscess in to peritoneal cavity was found. A total of 4 L of puss was removed from the left kidney. As treatment, since the left kidney lost all function and became a pus-contacting sac, we performed a left-sided nephrectomy and abdominal lavage. Postoperatively, the patient had an uneventful recovery and was discharged from the hospital on the eighth day. We followed him for 6 months, and kidney function tests were normal and he did not develop any complications. Conclusion: This case report highlighted the importance of recognizing the possibility of underlying kidney rupture in a patient with generalized peritonitis. Uretero-pelvic junction obstruction (UPJO) might be the possible cause of pyonephrosis in our case. As a treatment, nephrectomy is a preferable option when the affected kidney is not fully functional and the contralateral kidney is normal.